FunFoods Mayonnaise Diet – Quick fix for snacks — Reviewed! Being a working person, I am always on my toes. And being a foodie, can't compromise on good food. So, I usually lookout for a quick bite to grab or to cook something which is easy on time. 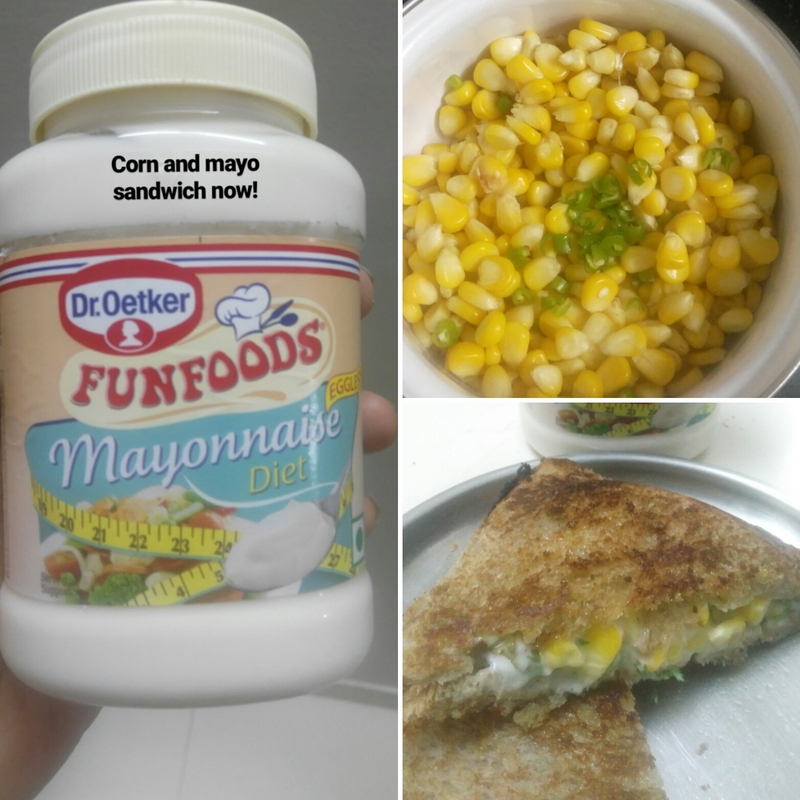 Recently, I came across Dr. Oetker's FunFoods Veg Mayonnaise (Diet) and trust me it is quite a versatile product. I tried different recipes out of it be it juicy sandwiches, rolls, burgers, dips, creamy Russian salads and coleslaws. I chose the low calorie version of Veg Mayonnaise from FunFoods because I can eat it guilt-free. Need to live up to my name of FitFoodie...hehe! Best part is that it comes with 38% less calorie content. The Mayonnaise is creamy, smooth silky and filling. Just mix it with any salad, dressing or spread over a bread and ready to go! Funfoods Mayonnaise is the mother of sauce for all quick recipes. Recently, I made the Corn Mayo sandwich and it was ready in just 15 minutes. Here is the recipe.. Mix all the ingredients together and spread over a slice of bread. Cover it with another buttered slice and toast it for few minutes. And voila! It is ready. Eat it with your favourite drink or like that only. This recipe can be followed by bachelors, kids or anyone who wants a quick grab! Cupcake Nation – Must try Holiday pack! – Reviewed! Love December! Winters,Christmas and New Year all together give very happy vibes! 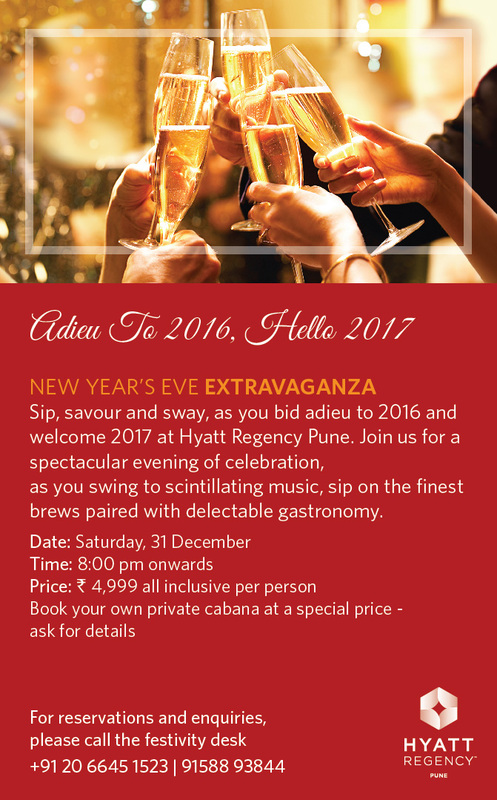 A season to eat, drink and make merry. Loads of chocolates, cakes, party, gifts around. Being a foodie, I always think of the lovely food we get around during the festive season. Think of Christmas and think of cakes. So, when I got the offer to try cupcakes from Cupcake Nation, I readily accepted! About:: Cupcake Nation is an online store with a back-end studio at Katraj with deliveries done all over Pune. The proud owner of Cupcake Nation is Athashri, who is a Computer engineer and has worked in an IT industry for 3 years. When asked about her passion she said,"I left the 9 to 5 job to venture out on my own. No formal schooling or training is done in the field of baking, I started baking just as a hobby. I have learnt & mastered every small detail in the field of baking on my own. Hobby plus the decision to start Cupcake Nation, this journey we have completed in just under 1 year. We are celebrating our first anniversary in February 2017 " Further she added, "Each creation you see is made 100% from scratch using high quality ingredients for an extreme flavour sensation." No wonder! Cupcake Nation is completely bootstrapped and have successfully completed more than 1000 deliveries in first year alone. I am so motivated with her inspiring story which truly interprets the saying, – Where there is a will there is a way! Follow your passion; follow your dreams and sky is the limit! Menu:: Apart from the cupcakes, they also have some droolicious Cakes and Cake jars. Cupcake flavours range from some classics like Choco Max, Red Velvet, Frappuccino, Peanut Butter Fudge to some rich like Dulce De Lech, Cookies Cream and lot more. Salted Caramel is my personal favourite in both cupcakes and jars. Total indulgence! Highly recommended! Holiday Pack:: So Puneites have one more reason to rejoice as Cupcake Nation has come up with the Holiday Cheer Pack which contains 12 mini cupcakes with Christmas and New Year topper in 4 different flavours – Chocolate Raspberry, Salted Caramel, Spice Carrot and Choco Max and bonus is the Double Chocolate Chip Cookies. Chocolate Raspberry - The perfect marriage of chocolate and raspberry. Small chocolate cupcake topped with a silky smooth raspberry, chocolate frosting with spicy sprinkles. Salted Caramel - One of my favourites! It is a chocolate cupcake with a fudge core topped with a caramel buttercream frosting and a caramel drizzle. Who would not fall in love with this combination! And best part was, it had X'mas topper – a Santa cap, A Christmas tree and handwritten Christmas wish. Spice Carrot – New addition to the menu. Perfectly moist, these are the medley of spice and sweetness with added grated carrots. Nice finishing touch was added to them by adding cute small carrots over the cream cheese frosting. Delish! Choco Max – Another sinful offering of chocolate. Valrhona chocolate cupcake filled with nutella and frosted with rich chocolate ganache made it irresistible. It had hand crafted new year toppers. Loved it! And the cookie was just also equally good. 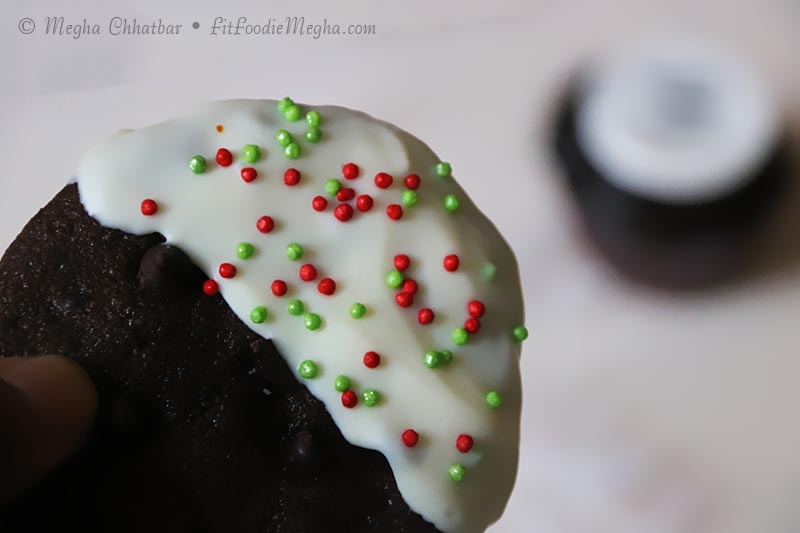 The Double Chocolate Chip Cookies were dipped in white chocolate and Christmas sprinkes to keep your festive mood high! Each bite had chocolate flavour in it. So soo yumm! People do try the Cupcake Nation for some gorgeous cupcakes. You can also get it customised. I am sure you won't be disappointed. Please note that two working day's notice is required for all orders. You can order from their website or follow them on..